One of the first news to get out of VMworld is that vSphere now includes the awesome source deduplication software Avamar in VMware’s vSphere Data Protection (VDP). This means that all customers, news and old, can upgrade to the new VDP version and get used all the goodness that is Avamar. Source deduplication means that VDP will look at the VM that is about to be backed up, see if any of the blocks that make up the VM have already been backed up on any of the machines that has ever been backed up. That’s right, Avamar has global source deduplication. This make a HUGE difference in lowering the necessary amount of network resources used to do backups, and of course shrinks the backup window needed to the least amount of time possible. Imagine making a FULL backup of hundreds of VMs in a matter of minutes. So Faster Backups, check. What’s also included is Avamar’s industry-first (and apparently only, so far) changed block recovery. Sure, almost all the backup tools out there use change block tracking for backups, but here we take it one step further and actually do restore using the CBT, essentially making it possible to recover a completely broken VM by only reverting to the changes that was made. Faster Recovery, check. Oh, and did I mention you get it free when you update to the new VDP? 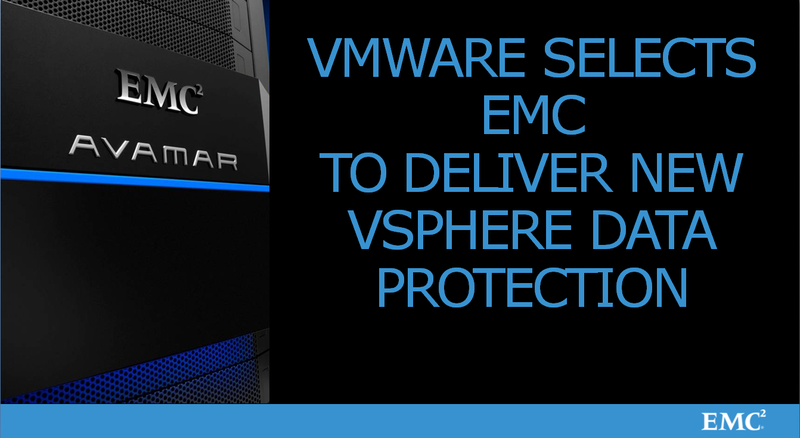 This entry was posted in Avamar, EMC, VMware. Bookmark the permalink.